"When Christ's public ministry began to gain momentum through His disciples' change of attitude toward prayer, Jesus then witnessed the impact in the invisible and later revealed that Satan himself had literally stumbled from his perch in the second heaven over the souls in that region...Prayer is about changing the atmosphere over lives." We are all too eager in western culture to systematize and scientifically analyze our surroundings and that is not the desire here. We also realize that the Scriptures warns that "we know in part and speak in part" [1st Corinthians 13:9]. Nobody has a corner on truth here and this is not an attempt at anything that hasn't already been said, but this condensing of what we have learned regarding prayer has been helpful to understanding process, principle and order. We hope this helps in understanding why coming together to seek God's heart is so important. When we see His Heart, that Heart will invade this world through us. Did you know that the phrase: "In Him we live, move and have our being" [Acts 17:28] is a direct quote borrowed from Greek poetry on the subject of Divinity? God chose the Hebrew and Greek arenas, because of their specificity. Or we might say that He sovereignly developed them to be specific for the purpose of revealing His Word. They are the two most exact languages in history for a reason! The picture being painted is of an invisible dominion of Satan, referred to as Hades, the first Hell or the Second Heaven. 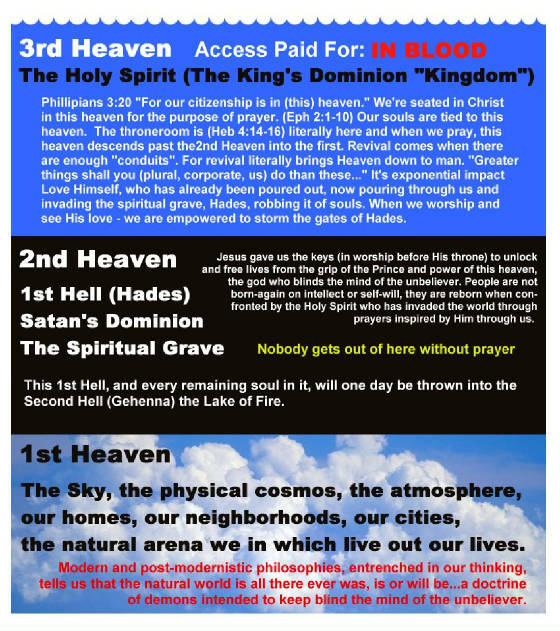 In other words, the First Hell is the same thing as the Second Heaven and those who've yet to be reborn, are prisoners to this invisible sphere that engulfs the first Heaven which surrounds this world. That may sound spacey to those of us in western culture, because of the influence of secular and naturalistic doctrines, but in the Third World, where the Gospel is spreading like wildfire, the supernatural realms are better understood. We have strayed from God's Word in our thinking because of an infectious "doctrine of demons" [1 Timothy 4:1] called naturalism, which claims that this physical world is all there was, is or will be. It is the mother of all the other philosophies from Darwinism, Secularism, Humanism, ect. Even American Christians have come to be infected with it as they often feel that the physical is more real than Heaven, but as C.S. Lewis points out, this world is the fading dream and God is the solid reality. One major part of Prayer is about clearing the air. The purpose of prayer is to be with Him; But the by-product is a holy atmosphere for Him to move. Consider that the atmosphere over Jesus' [Mark 6:5] hometown prevented Him from doing many miracles there. The Accuser, Liar and Prince of the power of the air probably pegged Jesus in our prideful minds as nothing more than a mere carpenter's son. Look how we peg each other where God is concerned. Jesus cleared the air over the home where Jairus' daughter lay dead, then he raised her to life again. [Mark 5:37-40] Prayer is about changing the atmosphere over lives. Christ specifically called for the removal of unforgiveness and anger in the atmosphere over our lives which is why He called for us to bind anger and loose forgiveness in a largely misunderstood passage among some of us. The coming together of two or three had to do with retaining the Spirit of love and forgiveness to advance prayer and friendship. Read the whole passage: [Matthew 18:15-35] Jesus is teaching the continual loosening of forgiveness. It was not a verbal formula for human power and will which we parrot in Jesus Name'. Christ's heart was "Come Together". Paul spent five chapters in Ephesians campaigning for the removal of pride and anger. The way he did this was to encourage the pursuit of unity in the Church universal among marriages, in the workplace, between different ethnicities and within the congregation of the entire city. Then, and only then, did he go into the subject of spiritual warfare. Today many Christian leaders jump to Chapter 6 and go gangbusters talking about fighting for truth and fighting Satan. We fight with angry words laced with phrases from Scripture. We fight politically. We just fight, plain and simple. But it is not the good fight of faith as we pretend. First off, we're to stand on truth because it fights for itself. In fact the Spirit is the one who wields it. Secondly, the divorce rate among American Evangelicals is higher than any other demographic in the world [Barna Research, Fall 2000] We need to spend more time reading Ephesians Chapters 1-5 first because the numbers show it is we who are getting kicked, not the Enemy. By the way, history records that revival broke out in Ephesus not long after Paul's writing. Nearly all there were saved. Apparently they took his words to heart. Whether your family has been completely shattered or has remained intact; whether you have conflict on every front or are at peace; You can pursue God and can pursue friendship; Even with your enemies. Our pursuit cannot be power. It must be God. It must be unity. Mowing the lawn for a neighbor, washing the dishes for the wife and sharing a cup of coffee with a friend are more exciting to God, than any display of power. His power serves purpose. This purpose is not about attaining power. That's Satan's spirit and passion. We need to always re-evaluate our hearts, lives and words before the Lord. The purpose of life is companionship in the context of a hierchy of relationships that begin with God. In short, it's about friendship with God and one another. If you do not ever know this deep down, you will never be free. God's liberating authority is only administered through our humility which begs the question: "What are we doing to humble ourselves before Him and one another?" Jesus wants the Christians of the Park Circle area and the entire Lowcountry to come together in prayer, not for religious pride's sake, but because of Love. When we do, friendships will be born and our prayers will have impact. Brothers and sisters, it is time to seek Him together. He will come to us. To Him, be all power, glory and honor.